Information on how to Prime and Paint MDF correctly. See the right primer and undercoat for painting MDF and achieving a great finish. Learn how to avoid an uneven or blotchy finish on your MDF and discover how MDF is made. Use our tutorial to understand why MDF is a good fibreboard to use in the home and understand why it is very important to seal the timber before installation. Painting MDF or Medium Density Fibreboard is not an easy job. The paint dries so quickly that it can dry in a very uneven and blotchy way. Special primers, such as the one below, are available for MDF and once applied the timber can then be painted with any ordinary paint. 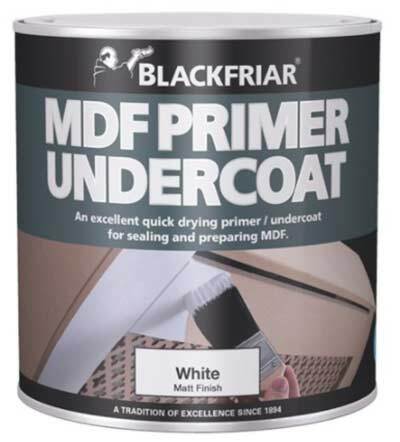 The MDF primer seals the timber effectively allowing other paints to dry in a uniform way. We recommend painting the timber with an undercoat, after the primer. 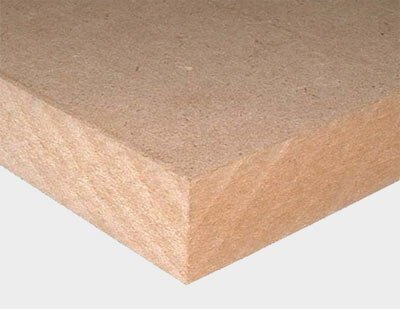 The surface of MDF, despite it’s density, is very porous. The moisture from ordinary paints is soaked into the MDF very quickly. This leaves a ″skin″ of paint on the surface which, because all moisture has been removed, does not adhere well to the surface. This means that every subsequent layer of paint applied to the MDF is only stuck to the layer (or coat) of paint below it, not to the MDF itself. This is the reason that, if MDF is not prepared properly, the paint sometimes blisters up resulting in large bubbles on the surface as air (or water) is allowed under the first coat of paint. 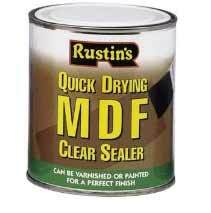 See the special MDF primers below to avoid this happening to you. Once the MDF has had one coat of primer it is a good idea to put on your mask and give the surface a very light sanding down. Then brush, or hoover off the dust and wipe down with a rag dipped gently (not soaked) in white spirit. This degreases the whole surface allowing the second coat of primer to be applied uniformly and form a great, sealed base for your undercoats and top coats. Remember, any painting is only as good as the preparation that has gone into it. NOTE: When sanding, whether it’s sanding primer, or the MDF itself and also cutting it, as we state above, always wear a suitable, decent mask! The dust produced by MDF is very bad for you if breathed in so protect yourself! Because MDF is so porous it is always a good idea to at least prime the underside of the timber before you install it. Water can run from the painted surface, over the edge of the MDF and soak into the unpainted edge. The edges of a sheet of MDF are even more porous than the surface of the sheet and over the years there have been many different techniques tried to get a good, even finish on the edges which matches the surface finish. The best method found by DIY Doctor is to apply an ultra-thin layer of wood filler to the edges, pressed well in with a putty knife or scraper, then sanded down using a sanding block. This prohibits the over-absorption of primer and paint. Many people do not put sandpaper onto a sanding block, tradesmen are the worst offenders and we hold our hands up to this. The fact of the matter is that sanding (usually) is to try and get surfaces as flat as they can be so sanding with a a flat surface (IE a sanding block) is really a no brainer….. A human hand, however you contort it, is not flat and the surface you are sanding will never be 100% flat if you use your hand. This applies especially to MDF as the pulp itself is so soft. Which Primer is Best for MDF? MDF is a man-made product constructed from organic wood products which have been broken down into fibres through being pulped and crushed. The resins used to bind MDF often contain Formaldehyde and other compounds which are quite hazardous to health. These compounds can escape into the air when the MDF is being sawn and can even escape from the edges of the timber in it’s free standing, sheet state. Priming the MDF properly is very important for, as well as sealing it ready for painting, it prevents the compounds being released. It is always a good idea to wear a mask when working with MDF, even if not actually sawing it. Firstly the trees (both hardwood and softwoods) are cut down and de-barked. They are then fed into an industrial chipping machine which is the start of the reduction process. None of the timber is wasted as the bark is used for landscaping products and all undersized chips are bonded and sold as wood logs. The chips are then fed into a screw feeder machine which heats them for 30 seconds to 2 minutes and then they are fed into a machine called a defibrator which grinds the timber down into a pulp while introducing very hot steam to further soften the timber. This entire process is done at a very high pressure. The pulp is then mixed with wax to allow the very light, very fine fibres to obtain a degree of resistance to moisture. A resin agent is also added to allow the fibres to bond and set together after the timber pulp is fed into giant trays of varying thicknesses and pressed under a very high heat which initiates the resin-bonding process. The resulting sheet is then cut into the required thicknesses and sizes. MDF then becomes a very uniform wood. Uniform in size and quality with no knots or rings. It is difficult to get a good fixing into the edges of MDF sheets but special coarse threaded screws are available for this. There are some drawbacks to using MDF, namely it swells with water and will not return to it’s usual shape. This however is easily overcome by priming and painting correctly to seal the sheet.